Find out what resources are available to you and/or your loved ones for in-home care from expert Roger Rhodes at Homewatch CareGivers, the leader for in-home care. Learn what Homewatch has to offer from their suite of in-home services for seniors, like care for degenerative disorders, dementia, after-surgery, chronic care and elder care. 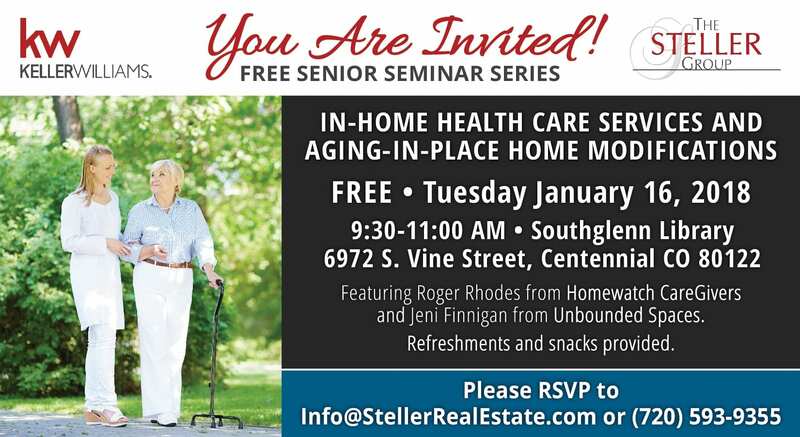 You’ll also hear from Jeni Finnigan, founder of award-winning Unbounded Spaces, on how to improve an existing space with in-home modifications for seniors who wish to age-in-place. Extensive resources will be available. Roger Rhodes is the owner of Homewatch Caregivers of Southwest Denver, an award-winning agency and leader for in-home care for all ages. Homewatch understands that there are many times in life when someone is in need of care for a few hours or on a regular basis for an extended time. Their trained caregivers are available to provide the assistance necessary, from as little as two hours to as much as 24 hours. They offer an initial evaluation to create a customized home care service plan designed around the unique preferences and needs of your family. There are no deposits or extra weekend charges, in-home safety assessments are free, and staff is available by phone 24/7. Regardless of your needs, Homewatch Caregivers are here to help take the stress out of a difficult situation. Unbounded Spaces specializes in creating beautiful and comfortable homes that are delightfully easy to use for all who enter. Jeni Finnigan, founder of Unbounded Spaces is an award-winning designer, occupational therapist, speaker, and leading expert in universal design. She provides holistic solutions through thoughtful design work, lighting plans, and seamless collaborations. Jeni firmly believes that the thoughtful and intentional creation or modification of spaces can support functional capacity, foster independence, and ensure the safety of the occupants, all while maintaining a graceful environment in which to live, work and play. Moving is complicated, and for many of The Steller Group’s clients who have been in their homes for 30+ years, it is simply overwhelming. We have a streamlined process for helping our clients navigate the sale process, and we act as the primary point of communication in coordinating all our clients’ moving needs. Ranked as the #1 Keller Williams team in Colorado for 2017, we are a team of trusted experts who work in concert with to make the move as painless and straightforward as possible for seniors or their families.